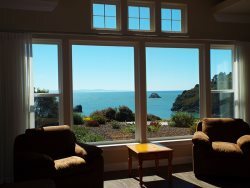 Trinidad Bay Vacation Rentals property managers offer 20 years local experience. We are happy to share our adventures with you. Putting a personal touch on our business is what we do best. Please feel free to ask questions regarding the local area guide. Our focus is providing the guest with an exceptional vacation experience. We are always looking to improve standards and service within our means. If there is something we can do to make your stay a bit more enjoyable, please let us know. Did the homes meet your expectations? It is also nice to hear how we made your stay enjoyable. Your opinion matters a great deal to us and helps improve the service to our guests. As always, we appreciate your business and look forward to serving you again. Please browse through our reviews of all properties below to see what others have thought of their rental experience. Please contact Lynda, the Property Manager, if you have any questions. "wow. stunning location and views. did not want to leave. book extra days! you'll be glad you did." "Be prepared to have your expectations exceeded! This gem has been added to our family's FAVORITES. We will absolutely be back to this house. It is perfect in every way"
"The house was super cute! I loved every detail about the space. There are neighbors who we did see but the back yard area is private with a view of the ocean. I wish we had visited when the weather was warmer so we could enjoy the backyard more. I was impressed by the size of the house and the master suite! My kids loved the house, too!" "Great location and clean stay with a park for the kids, green space trail for the pup, and close to all the great things Arcata and Humboldt County has to offer." "This space was beautiful! The art and decor was a special treat. The beds, bedding and linens were perfect. Great playground for the kids. Close driving to many beautiful beaches. Great home for a large family or group. Plenty of room. Definitely recommend." "Beautiful location, the house is stylish and comfortable. The garden and outdoor space make this place really magical. Loved sitting out in the hot tub listening to the ocean" ?? "This is a great place to stay. Very comfortable and clean. Very quick responses and easy to work with." "Great place to stay. Beautiful rooms, comfy living room and fully stocked kitchen. Four large bedrooms!"